للمسافرين الذين يرغبون أن يعيشو كل ما تقدمه ملبورن, Quest Gordon Place Serviced Apartments هو الخيار الأمثل. يجذب هذا الفندق ذو 4 نجوم، والذي يبعد 1 km فقط عن وسط المدينة و 30 km عن المطار، الكثير من الزوار سنوياً. يضفي محيط الفندق اللطيف وقربه من مسرح الاميرة, Melbournalia, مسرح الكوميدي سحراً خاصاً على هذا الفندق. يقدم Quest Gordon Place Serviced Apartments خدمات لا غبار عليها وكل أشكال اللياقة وحسن الضيافة اللازمة لإسعاد ضيوفه. يقدم الفندق واي فاي مجاني في جميع الغرف, خدمة غسيل ذاتية, مكتب الاستقبال على مدار الساعة, تسجيل وصول/خروج سريع, تخزين الأمتعة لضمان الراحة القصوى لضيوفه. استمتع بوسائل الراحة الراقية في الغرف أثناء إقامتك هنا. بعض الغرف تتضمن إغلاق, شاي مجاني, مناشف, سجاد, قهوة فورية مجانية لمساعدتك على استعادة طاقتك بعد يوم طويل. يمكنك طلب اللائحة الكاملة للخدمات في الفندق ومن بينها حمام سباحة خارجي. استمتع بخدمات لا يعلى عليها وعنوان ذو اعتبار في Quest Gordon Place Serviced Apartments . لتسجيل الوصول، يتعين على النزلاء الذهاب إلى 43، شارع لونسديل، ملبورن. تقدم خدمة التدبير المنزلي كل يوم ما عدا الأحد والعطل العامة. سيحصّل العقار مبلغ تأميني قابل للاسترداد قيمته 150 دولارًا أستراليًا عند استخدام البطاقة الائتمانية، أو سداد 500 دولار أسترالي نقدًا. We choose Quest because of its location. Each time, we hope that they will improve their facilities. 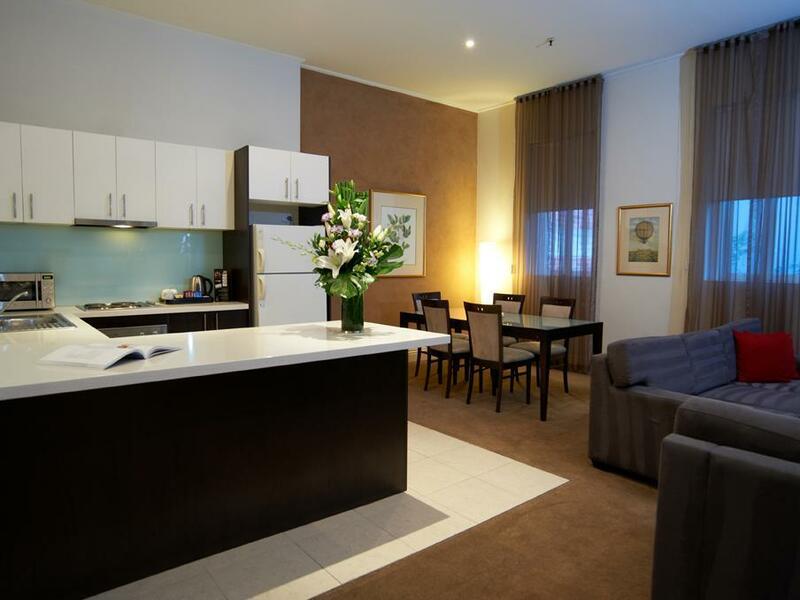 However, they remain below hotel and even serviced apartment standards. On this particular stay, we were initially assigned a room that had a malfunctioning ventilation system which compelled us to request for a room change. Our replacement room had an appalling shower stall which was too cramped for my husband who is a disabled person. The door of the shower stall was broken and Quest put a flimsy shower curtain over it. And the water pressure was extremely low and it took five times the usual duration to shower properly. The TV had poor reception and wasn’t working sometimes. The ventilation was also poor - the aircon would suddenly stop and then restart minutes or hours later. There is no makeup room or do not disturb sign on the door - which caused some inconvenience. The only redemption about this place is the staff - Mick is absolutely the best service staff I have encountered in Melbourne. He’s constantly friendly and extremely helpful, and every time we see him, it feels like we’re catching up again with an old friend. Thank you so much, Mick! Keep up your excellent work! 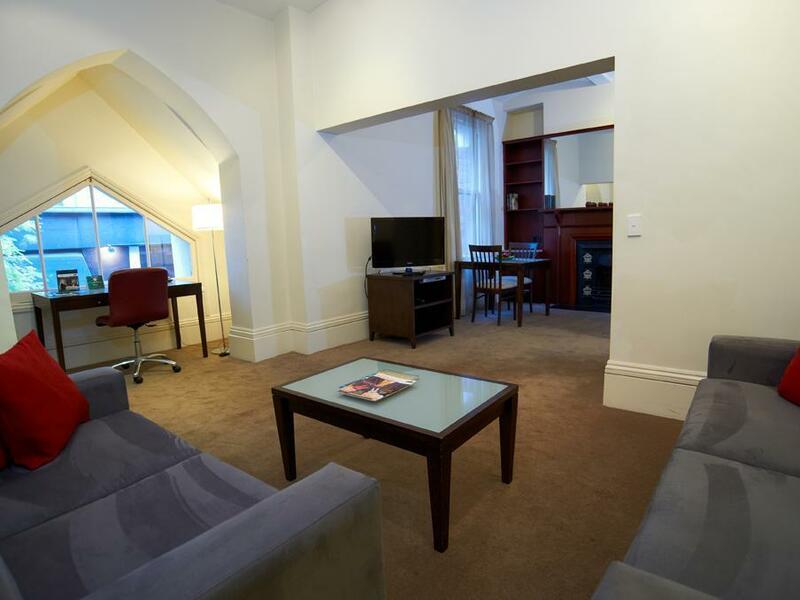 I actually booked this stay for friends who were required to stay overnight in Melbourne. not being frequent travellers they were very impressed with the rooms and the location. they informed me that the standout was the staff and their service given, always friendly, always helpful and always smiling. the only issue, and it was barely that was a bit of confusion in finding the entrance/reception. Beautiful heritage building at a fantastic location for exploring Melbourne. Plenty of restaurants, bars and sights in walking distance. (Make sure you try the ice cream from the Spring Street Grocer around the corner!) The studio appartments are very cramped, however the superior studios and appartments are wonderful. Please note that the reception is located at Lonsdale street. This made checking in a bit of a hassle. Despite adequate signage pointing you in the direction of the reception, you can’t actually make you way through to reception without a keycard. So make sure you enter through Quest on Lonsdale! We stayed in a studio unit for just the two of us. Earlier we stayed in the same unit from 19/10-2410/17. We extended our stay for 1 day on 25/10/17. The unit was just nice complete with all facilities that we needed. The mattress and pillows were very comfortable. Reception staffs were helpful and room service staff acceptable. Our only comments for immediate improvement are TV channel for room 29 had poor reception resulting in us not able to watch some TV programmes ,and internet slow response affecting our usage of emails and online transactions. Otherwise Quest Quality Service is ever reliable . We had a 2 bedroom, 2 bathroom double storey room (they said it was the only double storey room they had). It was so big! 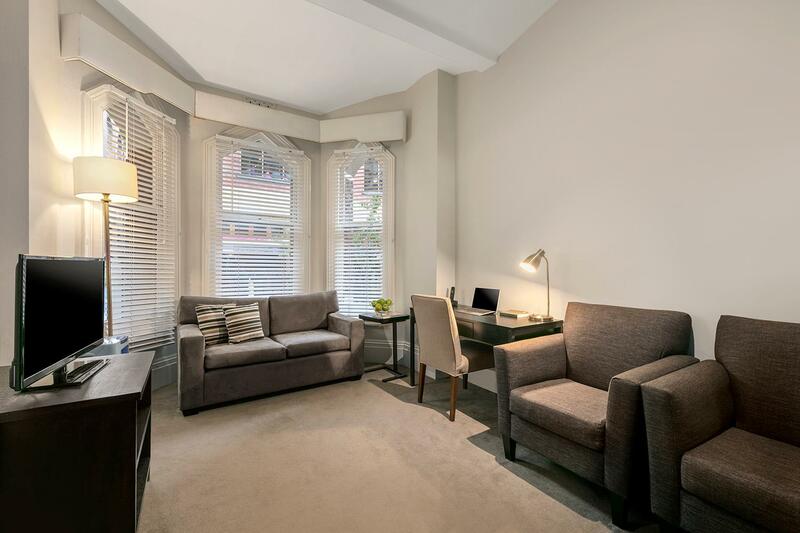 Great location as only a few minutes walk to some of Melbourne's best restaurant and bars. Would definitely go back again. You pay for what you get. This ain’t any hotel, more of a renovated rooms “inn” style. Demographic caters for more senior people who’s interested in this historical building. The room I booked was Studio Superior however it seems like they have given me a standard Studio room. The odour of a newly fresh painted walls are very strong, it feels like you have opened a can of paint with acrylic thinner sniffing it 24/7. The queen size bed is made up with two single beds combined and wrapped with sheets. Your bond is $300 cash or $150 for credit cards FYI. Book somewhere else if you like comfy stay but for location, this is for you. Location was excellent, accommodation was small (not a problem) but lack of natural light was a problem. Maintenance issues were being attended to not really a problem. Cigarette smoke coming through the air conditioning was irritating. But over all very good value for money. We would return. We stayed for 2 nights in May. We travelled with 2 young children and were quite comfortable. Great location, close to trams. Large living area which was great with the children. A must if staying here is to visit the little cafe "le petite on Bourke" delicious coffeee and pastries. If travelling with a pram perhaps ask to be located on the lower levels as the stairs and elevator are a challenge. We love the design of the building with classic english theme with modern design internally. The unit we had is nice with comfortable beds. The kitchen is clean and the utensils are still new and in good conditions. 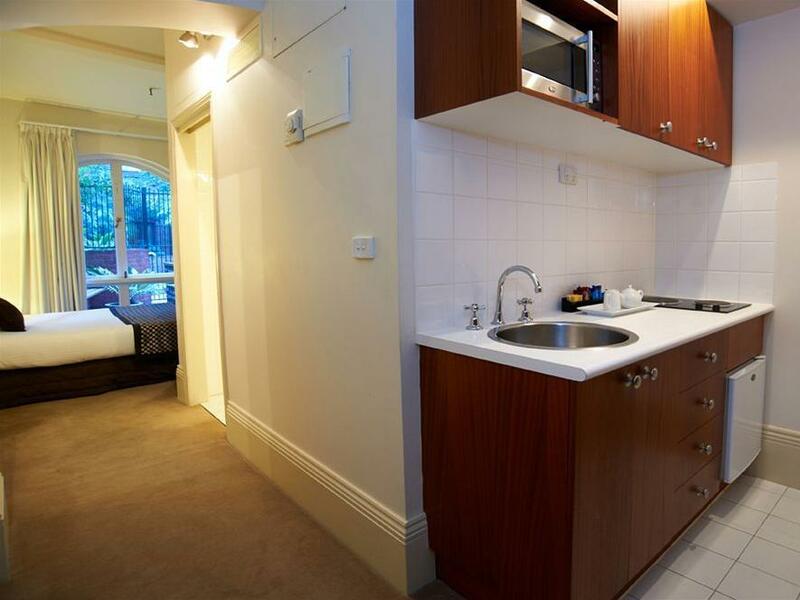 Good location near Chinatown surrounded with free tram zone. Interesting historic building, room could do with some updating and eye to maintenance detail but overall a very intriguing place with good atmosphere, really quiet. Great little bakery in the corner of the building. The facilities in the room that we stayed in were aged and not well maintained. There was no central heating and air conditioning system in place. And the receptionist asked me to self collect portable heaters from the reception area. The water tank in our room exploded and started to leak halfway through our stay on the fifth night past 1am. My husband who is disabled was asked to stand in a puddle of rising water to hold a string that prevented the water leakage from exarcerbating. I took his place instead and stood on a chair while holding a string. After about an hour, we were moved to another room in a adjoining property which was smaller and did not have proper facilities either. The cooker hood was broken and the water from the shower gushed out from the drain hole and submerged the bathroom in water. There were chips in our glasses and crockery. And our bedsheets were not changed for a few days until I made a request for them to be changed on the day of my birthday on 6 May. Amazing looking heritage listed building!! Couple of things though- 1. They didn't have my name in their booking system (they blamed Agoda for that...) 2. Got to the room- two windows, but only one had a bilnd... and it was at Street level with the footpath right outside!!!?? Went back to reception- they knew about it... happy enough to get us another room- thank goodness!! 3. Two burners on the stove- 1 didn't work... 4. Toilet roll holder falling off the wall... A big thumbs up for Koroi Walai at reception- a very helpful man!!! Remote entrance without even simple signage is a really annoying problem for first time visitors with luggage. Toilet light not working - reported it, cleaner sees it, but for 3 whole days till i left no staff could be bothered. Very laid back people running the place. Standing fan in room but with not a single reachable power point to plug in. What a joke! Found lipsticks on kitchen utensil and the cleaner of course just couldnt be bothered to clean at all! Left luggage room has totally ZERO security - no tag given. Any stranger is allowed to walk in and take anything and staff couldnt care less. WON'T BE BACK!! Will treat all Quests Hotel as last resort from now on. Good location which with walking distance to china town just maybe can add more kitchen equipment. If you can get this at the right price, it's good value. Rooms are small, connecting doors mean you can hear other people quite clearly. It's a bit of a rabbit Warren trying to get to the rooms. The reception for this hotel is literally 2 streets away on the other side of the block and you have to drag you luggage around behind you. Rudest staff ever and the manager fined us $25 for late checkout at 10:45 am - most hotels are 11am check out . The manager wouldn’t back down and laughed my face when I said I would complain to Agoda. NEVER STAY here ! I was initially disappointed as the apartment is very different to the shiny pictures they advertise. It is not at all modern. However, the building, the size of the rooms, how clean it was and the location soon made me realise what a great find it was. We would definitely stay again.